If you are interested in burger franchises, you need look no further than right here! Zac’s Burgers gives you the opportunity to become your own boss and be a part of an established brand that has a great reputation and a fun work environment. Zac’s Hamburgers is a fast growing casual business restaurant that is currently offering franchise opportunities to individuals who are looking to become their own boss. We offer wide variety of different foods, ranging from hamburgers to salads to wings to sandwiches. There’s something for everyone and we put a huge emphasis on making great food that keeps people coming back again and again. We already have a number of successful franchise locations and are looking for other individuals that are excited about the prospect of opening their own burger franchises and becoming part of the family! There are lots of different burger franchises available to you. Why should you choose us over one of the larger brands? Unlike those brands, we provide you with a real slice of the Zac’s pie and there are never any hidden costs or unwelcome surprises. Even if you have no experience with owning burger franchises, we will provide you with the support that you need and the expert training that will get you up to speed. This is so much more than a franchise-it is a great way to start your own business and be your own boss, without having to worry about making the pitfalls that so many other entrepreneurs encounter. The burger franchises that work with the Zac’s brand get a number of great benefits that you won’t see if you choose a different brand. For example, our business model is a sustainable one. We have striven to make sure that we have built a business that will not just be a success for the original Zac’s Hamburgers, but for every single burger franchise associated with us. When you start your own franchise, you become a member of our all-inclusive franchise program, which includes everything you need to be successful. The cost of getting started and the cost of buying goods are both low, and you only need a few members of staff to get started. The franchise model makes it easy for you to get off the ground, as you will be a part of a brand that already has name recognition and offers a product that people already know they like. Our franchise program comes complete with the training that you need to learn the business and it even has a built-in advertising campaign to help people know that you’ve opened your door. Even after you are up and running, we give you guidance when you need it, but will never micromanage you. You are not on your own when you open a Zac’s franchise, which is what makes it so much better than trying to start a business on your own. Access to a marketplace that is ready and waiting for your franchise – People will always want a fast and easy way to eat food that they love. The market for burger franchises will always be there and with our franchise program, it is simple and easy to break into that market place. 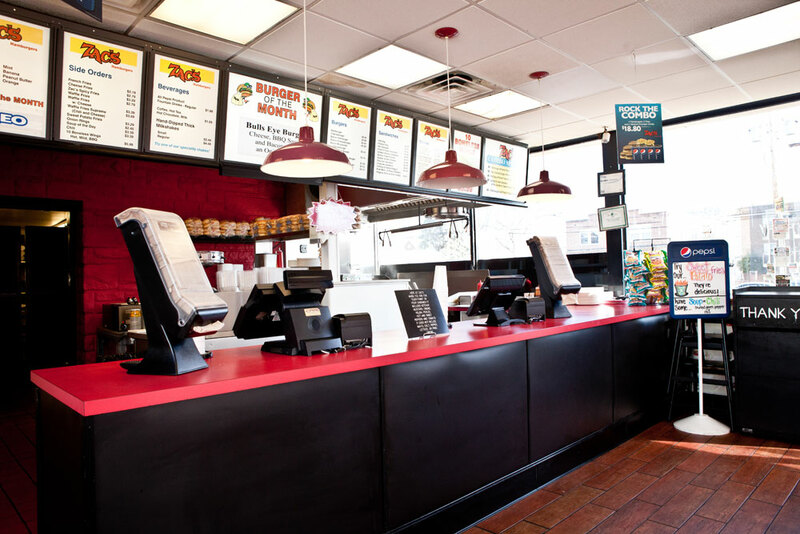 A popular menu – The menu that comes along with a Zac’s Hamburger franchise is an extremely popular one, in addition to being diverse. It has been tested and tried and we know that it will be successful not just at the original location, but at our franchises, too. It has already been tested at multiple locations! You do not need to be a millionaire to get started – Many other burger franchises expect you to be a millionaire before you start your own business, making it impossible for smaller entrepreneurs to dip their toes in the water and get a piece of the action. That is not true with us! The startup costs and costs are goods are relatively low, so you do not need millions of dollars and already be a success in order to open a successful franchise. Help with finding a location and leasing it – One of the most difficult parts about opening a restaurant is finding the right location and leasing it. Fortunately, we provide assistance with both of these tasks, so you do not have to worry about where your franchise is going to be or whether or not you will be able to obtain the perfect site. Because we already know what makes the ideal location for burger franchises, we can help you find the perfect spot. Training that gets you up to speed – You do not already have to be an expert at running a burger franchise in order to be successful with our franchise program. Ability to grow – If you decide that you want to expand your business, you absolutely can! We encourage our franchisees to think big! Right now is the perfect time to open a Zac’s Hamburgers franchise. With our guidance and proven franchise program, you can be up and running and making profits fast. It’s the ideal solution for anyone who wants to own their own business and be their own boss. Interested in becoming a franchisee? Contact us today!